ST. GEORGE — A mild winter often creates less problems for humans but can create havoc to trees, shrubs and landscaping, making it all the more important to get an early start on pruning and implementing an effective defense against disease-carrying insects. The temperature forecast released in October 2017 by the National Oceanic and Atmospheric Association said warmer-than-normal winter conditions are likely across the southern two-thirds of the continental U.S.
Warmer winter temperatures can have a devastating impact on trees, shrubs and other plants and can also increase the insect population. These effects can already be seen in different parts of Southern Utah. Trees may be hit hardest due to an interruption in the natural cycle of activity and dormancy. As temperatures drop it puts the trees into a dormant state, which is necessary for healthy bud and blossom development and sets the stage for an abundant yield. When winter temperatures remain mild, the tree doesn’t go into that stage, which makes it more susceptible to infestation and disease and is taxing on the tree because they never go into that “frost stage,” Mark Hodges, an arborist and owner of Arbor Tech in St. George, said. Winter pruning generally occurs at the end of January or beginning of February in order to improve the shape, health and safety of the tree. It’s also easier to see the structure of the tree without foliage covering the branches and where to make the cuts. Additionally, tree diseases are typically caused or spread by bacteria, fungi, parasites and insects, which are generally dormant during the winter months – but not this year. “With the short and unseasonably warm conditions it is important to prune trees earlier, which is right now,” Hodges said. Pruning is critical for prevention and management of disease and can help protect healthy trees from becoming infected, Hodges said, by stopping the spread of bacteria and other dangerous organisms that can kill trees. Pruning is also key to tree maintenance and has several benefits, such as minimizing the spread of disease agents, including insect infestation. More importantly this year, pruning right now will “force the tree into dormancy,” Hodges said, a sleep-state the warmer conditions prevented. Pruning also rejuvenates weaker trees and stimulates new growth, while giving the tree time to close the wounds made by the cuts before warmer weather brings out destructive insects and pathogens. Trees, shrubs and plants grow using energy from the sun combined with nutrients taken from the soil, which holds nutrients like a sponge until they are needed. Soil should be fertile, well-drained and regularly enriched with compost that holds a reasonable supply of plant nutrients. Fertilizing will be particularly important this year as well, Hodges said. When using fertilizer, it is best to use any nitrogen-based fertilizer sparingly, particularly with trees, as they “don’t like synthetic fertilizers,” Hodges said, adding that such fertilizers can actually burn a tree, shrub or flowering bush. Nitrogen helps plants make the proteins they need to produce new tissues, but in nature, the supply is minimal, so plants have evolved to use up as much as is available, even if it means they miss other nutrients in the process. If too much nitrogen is available, the plant may grow healthy foliage but not produce fruit or flowers. Growth can also be stunted. Using a compost-based fertilizer is preferable, and Hodges suggested “Gro-Power Plus,” or a similar product, which is made from organic materials and is designed for highly compacted soil conditions. This breaks up the soil every time water is applied and contains humus, which keeps the soil loose near the roots. Disinfecting pruning tools on a regular basis, particularly when working in areas where viruses, fungi or bacteria are present, is critical to prevent cross-contamination. Hodges recommends using either Lysol or a solution of 1 part bleach to 10 parts water to spray disinfect pruning sheers and other gardening tools. 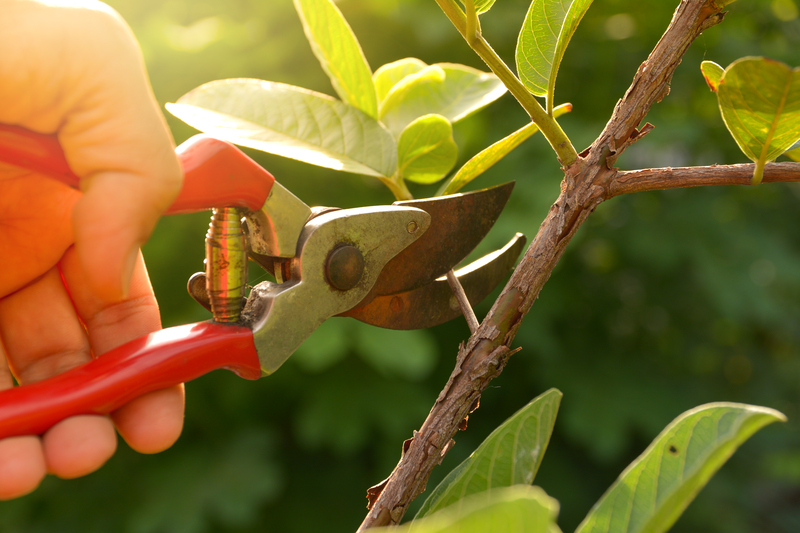 Remove and discard all cuttings and debris immediately after pruning, as the leaves and and blossoms carry high levels of bacteria that can reinfect a recently pruned tree. “The cold really wipes out insects, but that didn’t happen this year,” Hodges said. 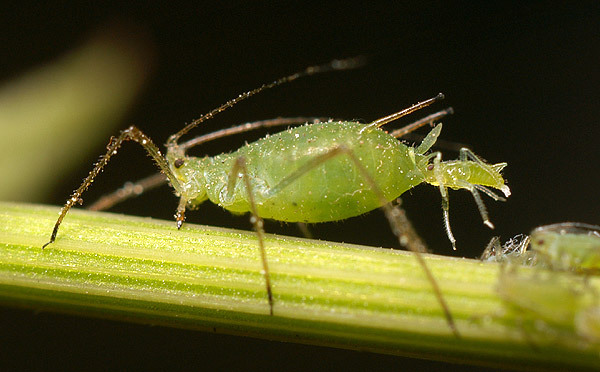 Over the fall months there was a massive outbreak of aphids, small, soft bodied, pear-shaped insects that may be green, yellow, brown, red or black in color, depending on the species. 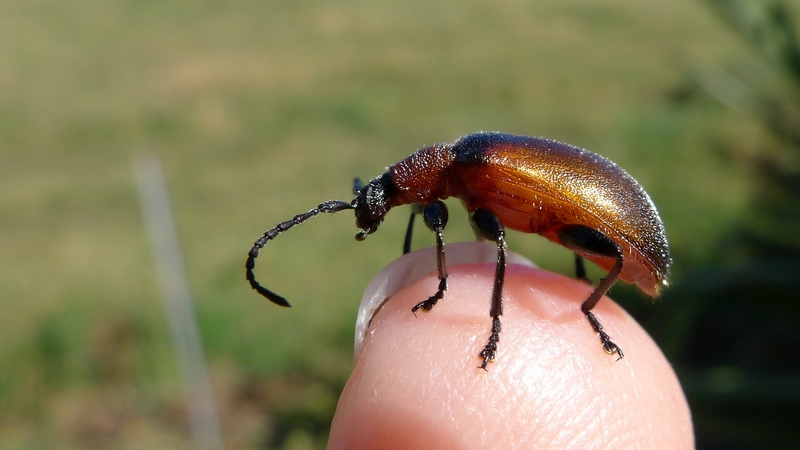 These insects are not harmful to trees and plants in low-to-moderate numbers, but heavy infestations will stunt the tree’s growth and weakens the tree or shrub making it susceptible to disease. In Southern Utah, it was the oak and pecan trees that were hardest hit this year, Hodges said, but the problem isn’t confined to those species alone. The insects are a piercing, sucking insect that drain the nutrients from the shrub or tree, secreting a sticky residue called “honey dew” in their waste that drops on cars and sidewalks, which is difficult to remove and is a nuisance. Using a systemic insecticide is very effective to control aphids, caterpillars, bark beetles, borers, leafminers, scale and many other pests, Hodges said, and works well for controlling the insects that feed under the bark of trees, as they spend most of their life where a topical application won’t reach them. This type of insecticide is applied to the soil and is pulled up by the tree’s roots. An internal transport system distributes it to all parts of the tree and kills any insect that feeds on it. As a result, systemic insecticides actually protect trees and shrubs from the inside out. They can take between two weeks to a month to begin working, but then last for up to six months, Hodges said. Systemics can only be applied after the tree flowers; otherwise, it can affect the bee population during pollination by contaminating the bee as it flies from bloom to bloom, which could spread the contamination to the entire colony. “Systemics can really have a negative affect on our bees, so only use them after the tree flowers,” Hodges said. Topical insecticides can be applied directly to the tree and work immediately but only last for several weeks. Both types of insecticides can be used together, but only in cases of a severe infestation. With no hard freezes or extended cold spells, the insect population across Southern Utah has not experienced the natural reduction that usually occurs in the winter, and many of them are now coming out of hibernation early to seek food and begin their reproduction process. “I’m already getting calls from clients because the insects that usually die during winter not only lived, but are already reproducing this year,” said Warren Church, a 20-year-veteran of insect extermination and owner of Church Pest Control. Most bugs spend the cold months largely inactive, waiting for the temperature to rise. Without an extended winter freeze there will be a carryover of insects moving into spring, which leads to an overall increase in the number of pests that are expected this spring and summer, making pest management particularly important this year, Church said. “Whatever you do, don’t skip your winter pest control rotation service,” he said. Insects carry disease and can cause costly damages to structures and landscaping, and just as termites and ants can destroy trees, they are also home wreckers, breaching the home’s defenses and building colonies inside of walls. 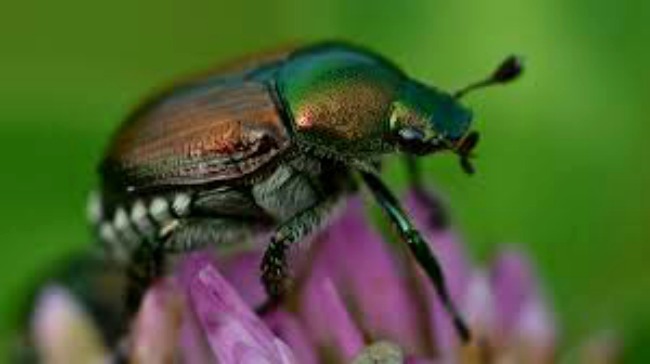 Japanese beetles are probably the most devastating pest of urban landscape plants and lawns, which are easily identified by their metallic green color and copper-brown wing covers, he said. These beetles only become inactive or dormant when the soil temperature drops below 50 degrees for an extended period of time. During the life cycle, the developing beetles, or “grubs,” feed on the roots of turf grasses and vegetable seedlings, reducing the ability to absorb nutrients or enough water to grow, which results in dry, brown patches across the lawn. The adults are voracious feeders that damage a wide variety of ornamental shrubs and trees and feed on the upper surface of foliage. Healthy grass and plants are less susceptible to beetle damage than grass or plants that are not being taken care of, Church said. Regular pest control maintenance can minimize the spreading of disease and damage caused by insect infestations, he said, whether it’s done by the homeowner or using a commercial extermination company. A “do-it-yourself” plan may seem like a cost-effective pest control plan, but using store-bought products are not as effective as commercial-grade ingredients used by licensed technicians, Church said. “What seems like the lowest price isn’t always the best deal, and you get what you pay for,” he said. Using a commercial pest control company may cost more up front, but the products used are commercial grade, so they are much more effective, and the chemicals are mixed by a trained technician, which can be tailored to a fit the individual’s needs. Additionally, a pest control technician will inspect the home and surrounding property using a professional eye, identify the pest or pests, and then set a treatment plan and provide future recommendations. Before allowing any pest control provider into the home, ask to see their license and certification and check to make sure it’s current. Utah requires technicians to be certified​ and to participate in annual training to keep the license current. “Make sure the exterminator is licensed, because they are coming to your home and spraying a poison, so you want them to know what they are doing,” Church said. Starting early with proper pruning, fertilizing and insect control will provide trees, shrubs, plants and grass an environment for strong growth while reducing the risk of disease and insect infestation, which will pay in a bountiful yield and well-maintained landscape. For more information on pruning, fertilizing and tree maintenance contact Mark Hodges, owner of Arbor Tech, at 435-656-1099. For more information on insect control contact Warren Church, owner of Church Pest Control, at 435-229-1484.